「とにかく小ぶりで美しいアームチェアが欲しい。」という思いからデザインした椅子です。「hata」という名は「旗」「凧」から。アームから背にかけての、はためくようなラインから名付けました。無垢の木を丹念に削り出していくことで、たおやかで女性的な印象の椅子に仕上がりました。（吉永圭史） I designed this chair from the idea that “wanted to create a slightly small and beautiful arm chair”. The name “hata” is from Japanese words “hata (flag)”, and “hata (kite).” This name is inspired by the line of this chair which looks like the fluttered flags. 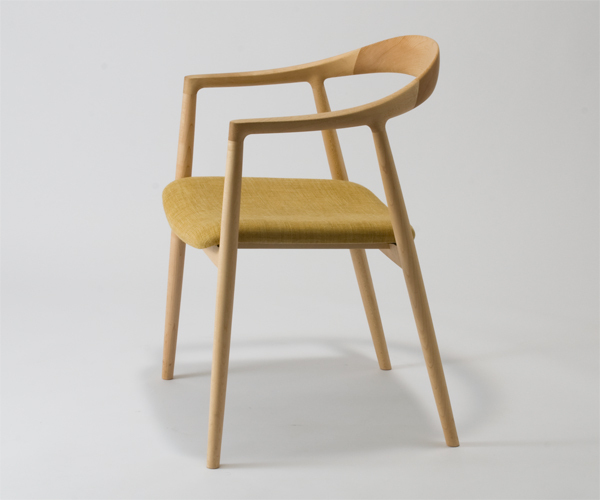 Shaving the natural wood elaborately, the chair’s impression is graceful and feminine.